I think perhaps if you move the ears up just a tiny bit the head won't look square! Thanks! Up forward or up backward? Thanks again and keep up the good work everyone! Hello, Bearfriend . . . welcome to Teddy Talk. So pleased you're going to try our free pattern! There are many of our members who sew the whole bear by hand, usually using small backstitches. I prefer sewing by machine because it's so much faster for me. Does the fabric you're using fray or ravel easily? If so, or if it is stretchy, you will have better success by backing it with a non-stretchy material. Enjoy making 'Goldie'! I'm thinking about maybe trying this pattern, but I much prefer fuzzy faux fur to mohair, so that's what I use, and I also prefer just fiberfill rather than the hard stuff. I'm all about texture. Is this okay to do it this way? Also, what kind of joints would you recommend for someone with no vision where I don't have to use a lot of tools? Can you find all this stuff at fabric stores or craft stores? I have trouble shopping online, especially for fabric because I like to feel it before I buy it. Hi, Jessie. Yes, you may use any kind of fabric you like to make this pattern . . . same for the stuffing. I would recommend using plastic joints - you need no tools for those. You can get all of the items at fabric/craft stores plus they also have plastic eyes that work similarly to the plastic joints. Have fun making your bear. 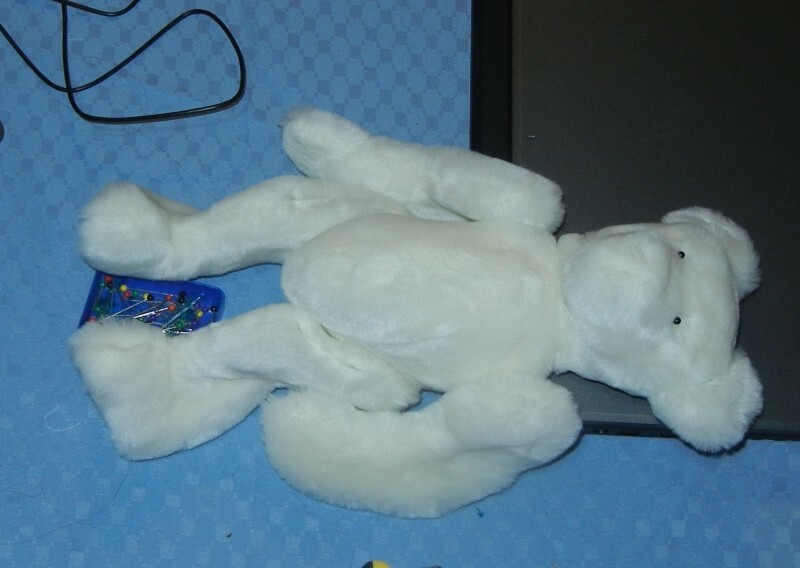 I was searching for a pattern for a bear, simply because I was bored and looking for a use for a chunk of synthetic fur I've got. I found the pattern for "Goldie" and now she's got all her parts sewn, she just needs to be stuffed, put together, and given her face. I think this will probably be the trickiest part for me, as I've never made a three dimensional stuffed animal for me. I'm incredibly excited to put the joints in her. When she's done (if I don't wreck her) I'll ship her over to England as a gift to my best friend. When I measured the fabric scrap I've got it came to 13.5 inches by 26.5 inches so I had to re-size the pattern down to 85%.With the thickness of the fur, and the incredibly small seams, I'd imagine she came out to be around the original size any way! I sewed her by hand with 1/8 inch seams using snow white synthetic fur. The pile is very plushy and when the fabric is laid on a table, pile up, it's about half an inch high. She'll probably have simple (shiny) black button eyes and I wont be putting a joint in her neck. For her pads what I ended up doing was cutting them from the same fur, then shaving them bald with an electric hair trimmer my husband has. They came out with a nice, soft velvetine like feel, and look great against her long hair. Her mouth and nose will probably be black cotton stitching. When she is done I'll post a picture up here, and a more formal 'thank you' to Sue Ann for sharing this pattern. Do let us see her when she's done! I was more than happy to share this pattern, Shel, and I'm looking forward to seeing your finished creation! Thanks for the encouragement! Here is a picture of her when I finished sewing her parts last night. She obviously isn't stuffed or jointed, just held together by pins. Her eyes are pins at the moment too. I'll be going out and getting her eyes today. Could anyone recommend a good eye placing tutorial for button eyes? The ones with little loops on the back for attaching? I'd prefer to have them pull the fabric around her eyes in a bit, to help shape the head. Thanks and well wishes for all of your bears/animals! Hi coco, and welcome! You'll find the Goldie pattern in this same section--the fourth "sticky" in the list of topics. Thank you so much SueAnn for the Goldie pattern. 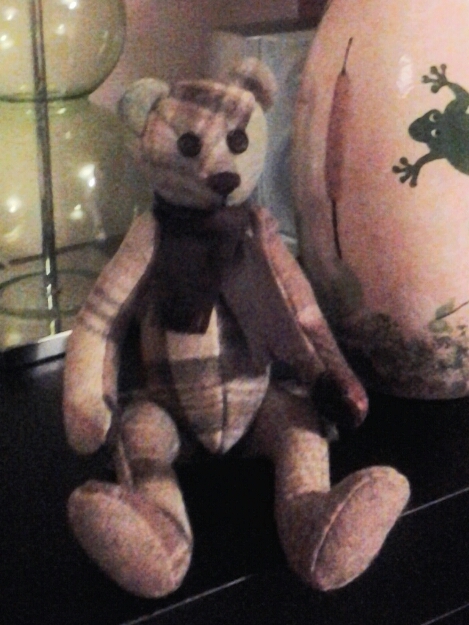 This is my first attempt at bear making. I used 100% wool scraps given to me by a college after a visit to a mill. I think he looks like a English country bear. Loved tbe pattern and I am looking forward to doing it again in fur. This is my first attempt at bear making. Congratulations on your first bear! The wool fabric gives him a warm and homey look. Fantastic wool bear, Susano, and you are very welcome for the pattern. I look forward to seeing your next one in the fur. Here's my take on Goldie. 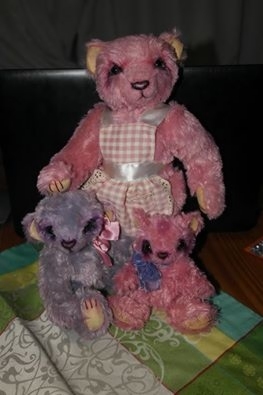 The cubs are the pattern altered - the child has slightly shorter arms, legs and body and a slightly larger head, the baby even more so. Congratulations on your bear family, Nina . . . you did a great job!! I like the fact that you altered the pattern to accommodate the proportions of the child and baby! Sue Ann, thank you very much for sharing the pattern. It's a lovely teddy, a pleasure to make also. Becky, thank you for the kind words. She has a classic 'beariness' about her, I think part of the pattern, that I really adore myself. Thank you, Becky, for responding to jammer2 . . . appreciate your help. I have a question about this bear. I'm thinking about making him, but is it okay if I use plushie fur instead of mohair?